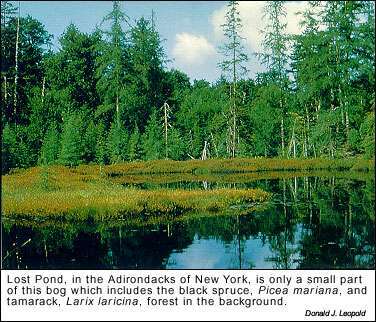 A bog is a wetland type that accumulates acidic peat, a deposit of dead plant material. The term peat bog in common usage is not entirely redundant, although it would be proper to call these sphagnum bogs if the peat is composed mostly of acidophilic moss (peat moss or Sphagnum spp.). Lichens are a principal component of peat in the far north. Moisture is provided entirely by precipitation, and for this reason bog waters are acidic and termed ombrotrophic (or cloud-fed), which accounts for their low plant nutrient status. Excess rainfall outflows, with dissolved tannins from the plant matter giving a distinctive tan colour to bog waters. 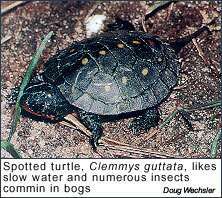 Bogs are recognized as a significant habitat type by a number of governmental and conservation agencies. For example, the United Kingdom in its Biodiversity Action Plan establishes bog habitats as a priority for conservation. Bogs are challenging environments for plant life because they are low in nutrients and very acidic. 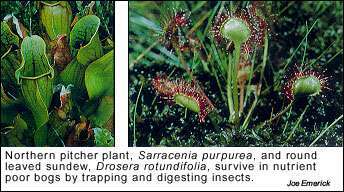 Carnivorous plants have adapted to these conditions by using insects as a nutrient source. The high acidity of bogs and the absorption of water by sphagnum moss reduce the amount of water available for plants. 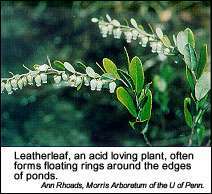 Some bog plants, such as Leatherleaf, have waxy leaves to help retain moisture. Bogs also offer a unique environment for animals. The word bog often evokes a picture of a pond with a ring of sphagnum moss, but the term bog actually describes the larger area of wet organic soil in which these ponds occur. Bogs are generally formed in depressions where the combination of cool climates and abundant moisture retard the rate of decomposition resulting in an accumulation of organic matter. They are hydrologically open systems, but receive little or no discharge of water from groundwater aquifers and are, therefore, dependent on precipitation for moisture. Bogs produce near normal amounts of surface runoff and may recharge small amounts of water to regional groundwater systems. The resulting chemistry produces nutrient poor acid conditions and less than average productivity. However, low tree productivity is largely offset by high moss productivity. This causes the accumulation of peat further restricting water movement and raising thewater table. This accumulation of water and peat is self intensifying and can eventually result in expansion and overlaying of adjacent areas with peat to create blanket bogs. 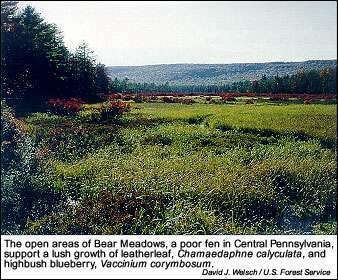 The dominant vegetation is adapted to the cold, wet, nutrient poor, acidic environment and includes black spruce, tamarack, Atlantic white cedar, Northern white cedar, alder, sphagnum moss, sedges and heaths ubiquitous to bogs such as highbush blueberry, cranberry and leatherleaf. Other plants adapted to this environment include carnivorous plants such as pitcher plant and sundew and managers should address the possibility of threatened and endangered species in management plans for these areas. 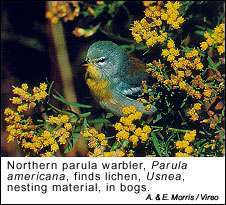 Wildlife using bogs include bog lemmings, four?toed salamander, spruce grouse, massasauga rattlesnake, wood frog; moose, spotted turtle, water shrew, ribbon snake and neotropical birds such as the olivesided flycatcher, northern parula warbler, baybreasted warbler and blackpole warbler. There is seldom reason to enter the floating sphagnum mats surrounding open water portions of bogs and the best advice is to go around them. Forested bog peatlands tend to occur in areas such as Minnesota, Michigan and Maine where the ground freezes during the winter months. Management activities on the forested areas should be restricted to periods when the surface is sufficiently frozen to support harvesting and other equipment and should utilize the Best Management Practices listed for frozen conditions. 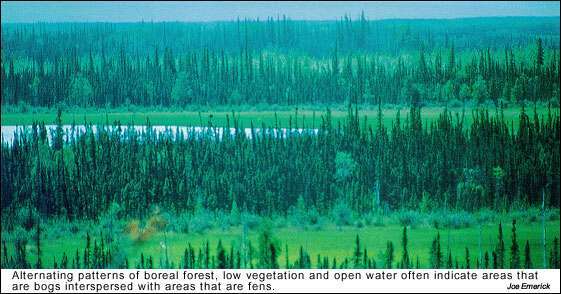 The feature that distinguishes fens from bogs is the fact that fens receive water from the surrounding watershed in inflowing streams and groundwater, while bogs receive water primarily from precipitation. Fens, therefore, reflect the chemistry of the geological formations through which these waters flow. In limestone areas the water is high in calcium carbonate resulting in fens that are typically buffered to a near neutral pH of 7. However, the level of calcium or magnesium bicarbonate varies widely in fens. At low levels of bicarbonate the pH may be closer to pH 4.6 resulting in an acidfen. At very high levels of bicarbonate, the water may reach a pH of 9. Thus, there is much variation among fens with respect to acidity and they often do not have the extreme acid conditions associated with bogs. The common features of both bogs and fens are that they accumulate peat and occur in similar climatic and physiographic regions. Indeed, they often occur side by side, one grading into the other. Under the right conditions, peat can accumulate in low domes that effectively separate rain water in the dome from calcium rich groundwater in the underlying fen. The plant community of the fen is more varied than that of a bog and where heaths are more plentiful in bogs, sedges tend to be more plentiful in fens. Typical cool, wet climate vegetation is common with acid loving species occurring as scattered inclusions on hummocks. 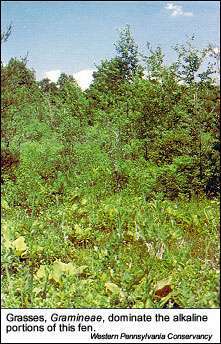 The species composition of acid fens is similar to bogs and includes black spruce, Virginia pine, tamarack, willow, birch, orchids, leatherleaf and random sphagnum mats. As noted previously, many fens are acidic. However, fens receiving water from limestone or calcium carbonate geologic sources are much less acidic. These calcareous fens support a groupof plants that differs somewhat from the group of plants found in acid fens. 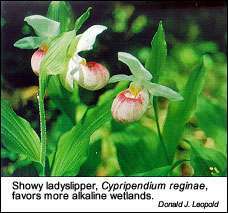 The calcareous fens tend to be dominated by grasses and sedges as well as calcium loving trees such as northern-white cedar and Atlantic white cedar instead of the sphagnum moss common to acid fens. 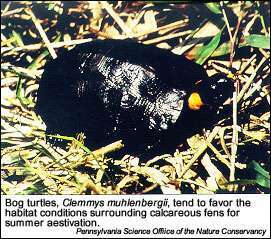 Some species of wildlife such as bog turtles are more common in calcareous fens where they use the shrub layer for aestivation, or summer hibernation, particularly in the northeast. 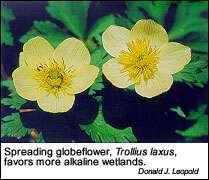 Wildlife species groups associated with acidic fens are similar to those associated with bogs. 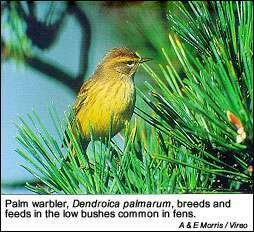 They include species such as the bog lemming, fourtoed salamander, spruce grouse, wood frog, moose, spotted turtle, water shrew and ribbon snake and neotropical birds such as the northern waterthrush and palm warbler. 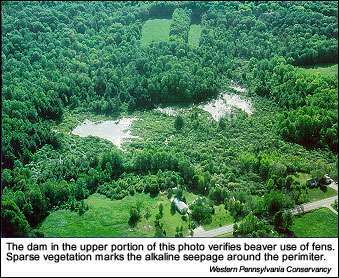 Because surface outflows trigger their damming instinct, beaver will occasionally occupy fens when more desirable habitat is unavailable. trout water, provides important habitat for small, newly hatched brook trout. The trout survive because the organic acids that impart color to the water also tend to congeal soluble forms of aluminum which could otherwise be toxic to trout, particularly young trout. Trout in these streams have been observed to survive spring "acid shock" loading when trout in nearby clear streams have not survived. 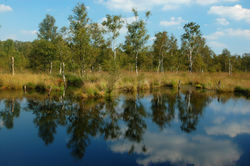 Europeans refer to peatlands, both bogs and fens, with the word "mire" which says a lot about operating in these areas. Machinery can be "mired down" unless operations are con ducted under frozen conditions. These areas, by virtue of the conditions necessary for their existence, are rarely dry, so operating in a dry sea son is all but impossible.